Butternut squash and pumpkin seeds are quickly becoming favorites of mine. The former is a yummy root vegetable that doesn’t need to only be used in tandem with sweet potato, but can shine on its own. And the latter has a savoriness that can be a canvas for other flavors, and is also great as a snack! So, naturally, I was looking for a way to use butternut squash and pumpkin seeds together. This dish allows the flavor of each ingredient to come through and compliment the other, and also is a great foray into homemade pasta dough, which is a lot easier than you might think! First, roast the squash along with some onion and garlic until just charred. While this is all roasting, make the dough. The only ingredients are flour, eggs, olive oil, and water! I also added in some herbs just for extra flavor. Mix all this together with an electric hand mixer and chill it in the fridge until the squash is done. Once all the veggies are done roasting, puree them with a bit of parmesan and brown sugar until smooth. Set this aside to cool while you’re shaping the dough. Roll the dough out about a 1/4-inch thick and cut it, lengthwise, into two equal pieces. Then, place one of these pieces of dough over an ice cube tray, pushing down with your fingers into the individual wells. Fill these with the squash puree, cover with the second piece of dough, and flip the whole thing over. Cut these into individual raviolis along the lines, and cook in boiling water for about 5 minutes. Now it’s time for the pesto. Pesto is a sauce made of veggies and nuts, and though beets and pumpkin seeds are not the traditional choice, there’s no reason they can’t work! All you have to is add these, along with some oil and parmesan, to a food processor and blend away. This sauce is thick, yet provides a delicate flavor that compliments the squash in way that will have you licking your lips. Now, yes, this is on the more complicated side of things as far as Kosher Kollege goes. However, one key point helps out: there’s a lot of room in this recipe to be clever about working on different parts efficiently. As long as you make sure to be working on something active while something else is resting or cooking, this recipe is a lot easier than the finished product would suggest. This pasta dish looks impressive, but comes together quickly from fresh, simple ingredients! The sweet and savory combo of the squash filling and pumpkin seed pesto will have you coming back for more. Dice the butternut squash and onion. Season this, along with the garlic, in salt, pepper, and olive oil, and roast at 425 for about 30 minutes, or until just charred. While the squash is cooking, make the dough. Combine the flour, eggs, and water together with a hand mixer. Chill the dough until after you've finished the squash puree. 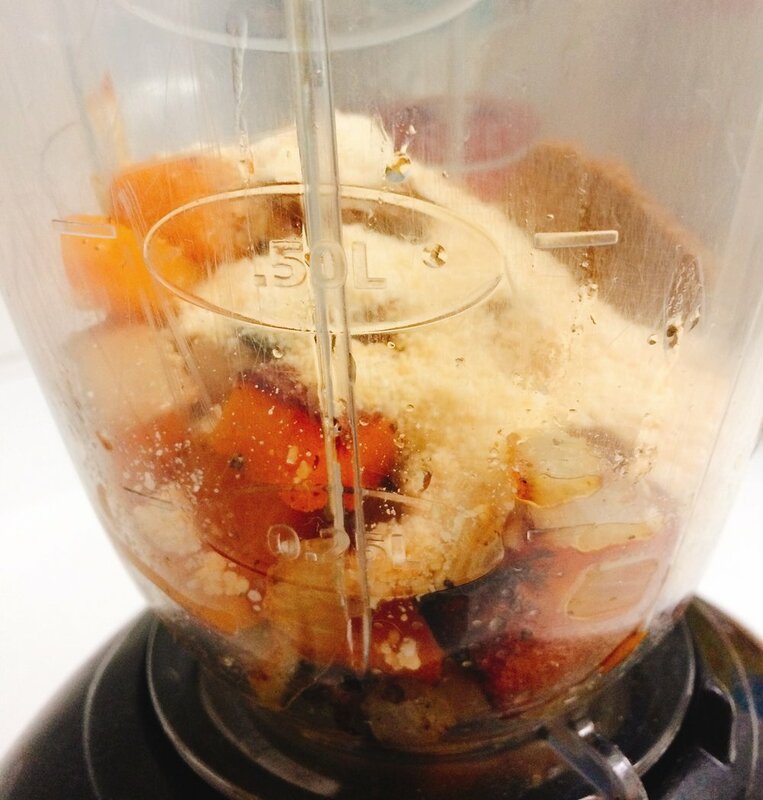 Add all of the roasted veggies, the brown sugar, and 1 tbsp of the parmesan to a food processor and pulse until smooth. Take the dough out of the fridge and roll it to a 1/4-inch thick. Cut lengthwise into two pieces. Lay one piece of the dough over an ice cube tray, pushing down with your fingers into the individual wells. Add a spponful of butternut squash puree to each well and cover with the second piece of dough. Flip over, cut, and cook in boiling water for 5 minutes. Add the beet, pumpkin seeds, olive oil, and remaining parmesan to a food processor and pulse until smooth. Serve the pesto over the pasta and sprinkle with parmesan.